Crown Prince Nikola (r.), Mr. Nazif Cungu (c.), Crown Prince Leka II. (l.) in Ulcinj, Montenegro. On the occasion of the opening of the 13th edition of the Ulcinj Book Fair, and on the invitation of the mayor of Ulcinj (Montenegro), Mr Nazif Cungu, HRH Prince Leka II of Albania, his fiancée, Ms Elia Zaharia, and HRH Prince Nicolas Petrovitch Njegos, head of the Royal Family of Montenegro, were invited to hold an official and friendly meeting mid-August. Their Royal Highnesses and Ms Zaharia were kindly received by Mr Cungu at the City Hall of Ulcinj..
Their Royal Highnesses and Ms Zaharia were kindly received by Mr Cungu at the City Hall. 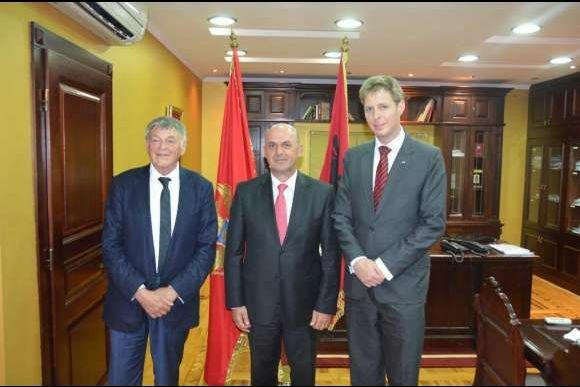 The discussions evolved not only around the current agenda in the cultural sector of the city of Ulcinj, particularly marked by an exemplar and peaceful coexistence between the Montenegrine and the Albanian communities, but also tackled the evaluation of a concrete cooperation between the two Royal Families and the City of Ulqin. Mr Cungu stressed the fact that the authentic friendship wich characterises the two Royal Families’s relations is the sign of a new democratic reality and of a new style of dialogue in the whole area.